The other day, I accidentally made today’s DIY project. I was planning to make something else entirely and then a little lightbulb went off in my head and I switched gears. Don’t you love it when that happens? 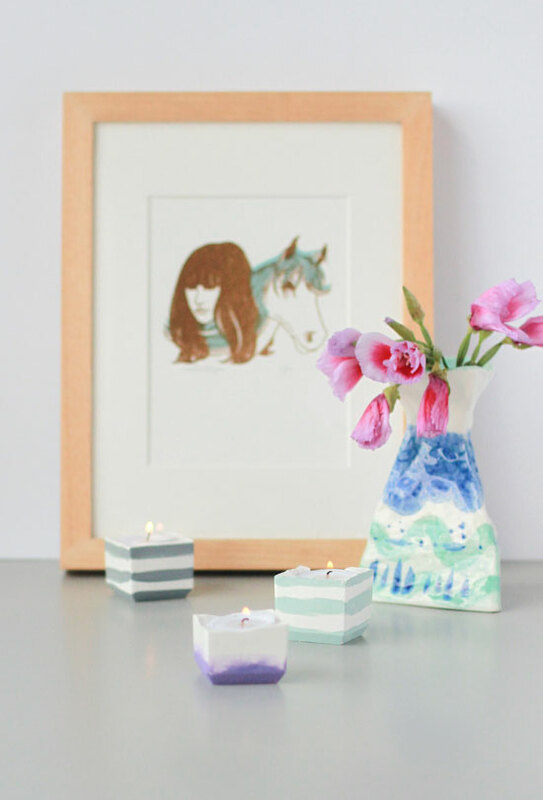 So, today’s edition of Make This will take you through making these modern, painted candle votives for just about any occasion: Mother’s Day, a housewarming party, a wedding. 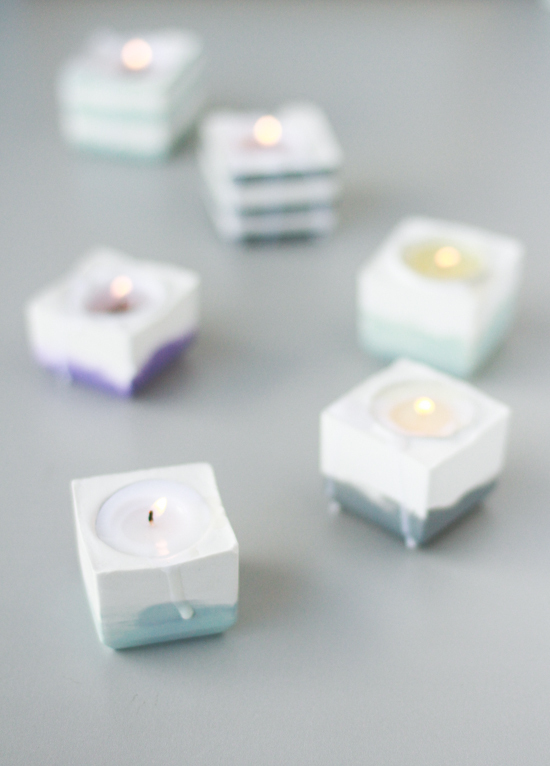 You name it – these DIY votives can adapt to pretty much anything, which is great. But the best part about this DIY is actually the price. About $5 worth of plaster and $5 worth of tealights will make roughly 50 completed votives. 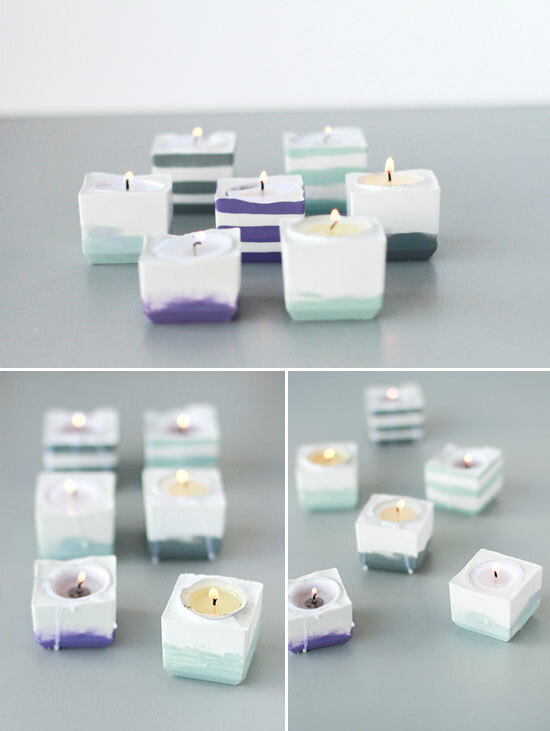 That makes each votive $0.20 to make from start to finish. Does it get any better than that? 1. Scoop powdered plaster into a small container and mix with water according to directions. 2. Stir water and plaster mixture until you achieve desired consistency, which should be similar to pancake batter. Plaster sets very quickly, so you will want to work fast. 3. Pour mixture into square mold or gently scoop the mixture in with a spoon. 4. Wait 2-3 minutes for it to start to set up. While it’s setting up, remove the candles from the metal shell they sit in. And place one in the top of each square. Then add coins or other small heavy objects to weigh it down, so it say in place. 5. Set aside and allow the plaster to harden for at least one hour (dry time may vary). 6. Carefully remove the plaster numbers from the mold one at a time and let them finish air drying for a full 24 hours. 7. Now that your numbers are completely dry, you can seal them with matte medium (optional) and then begin painting them. 8. Wait for the votives to dry completely, add the candles back into the tealight shells and you are done. There are so many uses for these little guys. 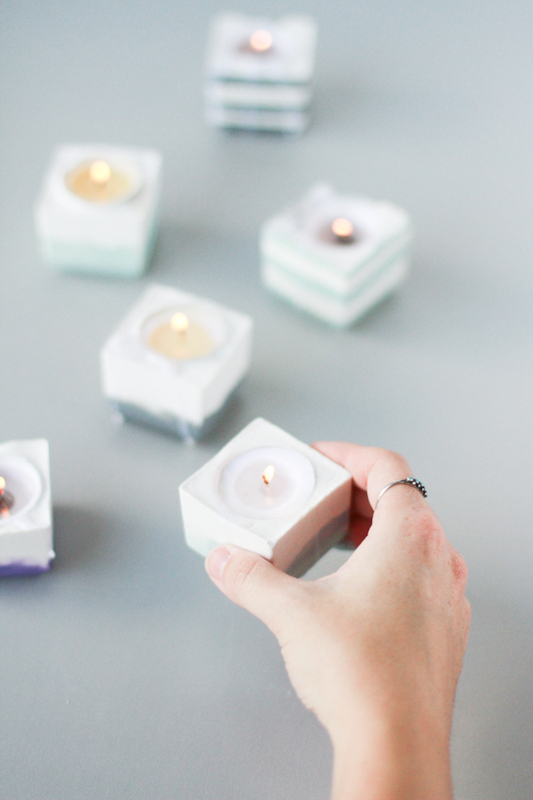 You could give a set of votives to your mom for Mother’s Day, use them as a housewarming gift for a friend, or turn them into cool wedding favors. Or keep them all for yourself. Want more DIY ideas? Click here. These are awesome!! I love the idea of using them as a housewarming gift! Thanks Kel! I have these all around my house right now. Wish I had a housewarming to go to so I could unleash some of these. Ha! Thanks McKenna, Juni and Coffee mornings. They were so fun to make. I think I have a new addiction. Thanks Steph. Yep, definitely love those lightbulb moments. And speaking of love…I love your ‘Fresh Flowers Idea’ roundup from today – so many pretty ways to use flowers. And thanks for including my project! Ooo love these! Thinking of doing some watercolor inspired ombre colors. Thanks for the idea! Oh, a watercolor ombre effect would be perfect for this project! Thanks for stopping by Lorraine. Your blog is great! Just checked it out. 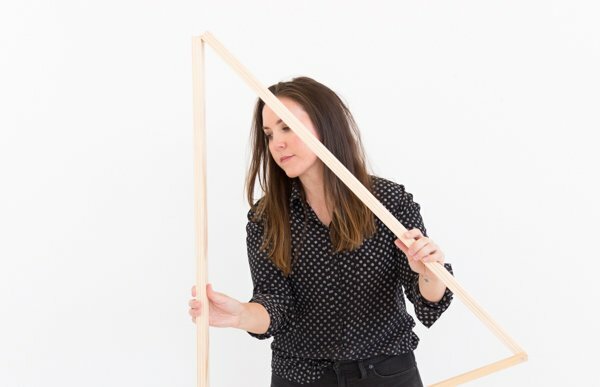 I just found your blog through Designlovefest and will be following you. your content is stellar! I’ll take note of the votive idea for a rainy day. Well, thanks Jane. So glad you found me. So adorable! 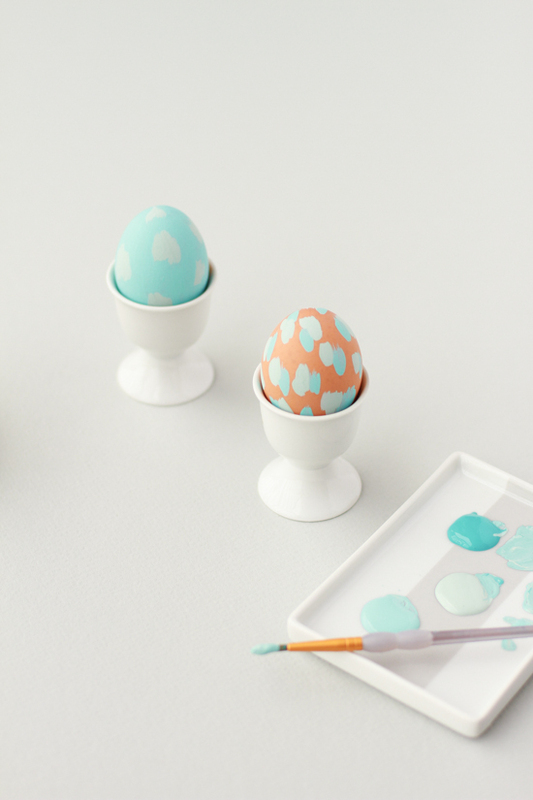 As always, you DIYs are inspiring! Thanks you for sharing. Awesome Lemonade Budget! Let me know how they turn out. Looks like a super fun project! Does the matte medium make a big difference on the outcome? What exactly does it do? Hi Christie. It just seals the plaster, making it less porous when painting. It didn’t make a big difference for my votives, but I like to have that option. Just in case. Thanks Julia. I’d love to know how it turns out for you if you try this DIY. Thanks Zina. And speaking of amazing…that first yellow dress from Etsy on your blog right!? Love it! This is wonderful!! I love this perfect project and will do it this week! I used colored plaster instead of painting saved myself. Step, you can use god color and change the color of your plaster I did! Had fun dong it! Awesome Sherry! Love that idea. Makes the project even easier. Such a neat idea. Thanks for sharing. LOVE this idea! Does it matter what kind of plaster to use? Or could you tell us what brand you used? Thanks Claire. I don’t think it matters what kind of plaster is used. I bought mine from Hobby Lobby in the kid’s craft section. So, it seems that any kind (no matter how inexpensive) will work. any of you know the name of matte medium in Spanish? What kind of sealer did you use here? I have plans to use these in my wedding. Have been looking a an inexpensive way to scatter tea lights all over the tables. Thanks for sharing! You can use gloss or matte medium if you’re looking for a sealant. Hi, do you think that the silicon mold will work with concrete? 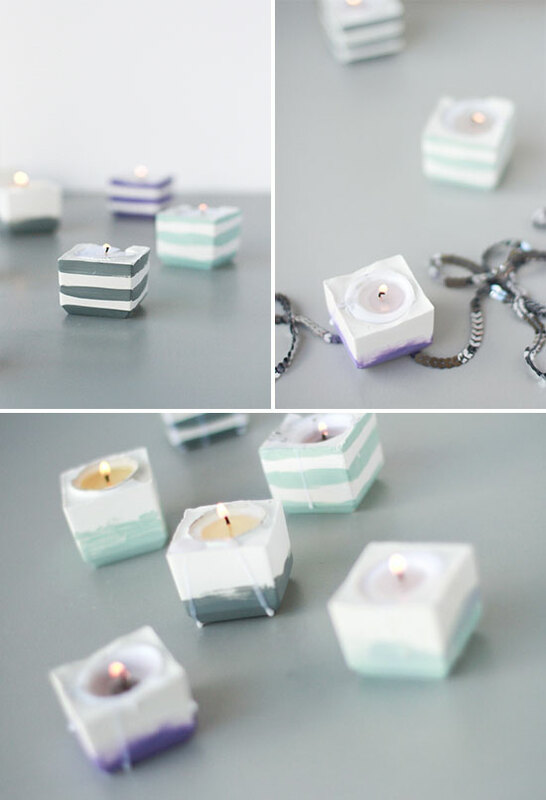 These DIY votives are super cute! They look easy enough for kids to make and would be great DIY teacher presents for kids to make for their teachers.